Now is the time to fix our old voting machines. We can’t wait until something goes wrong in the next election. 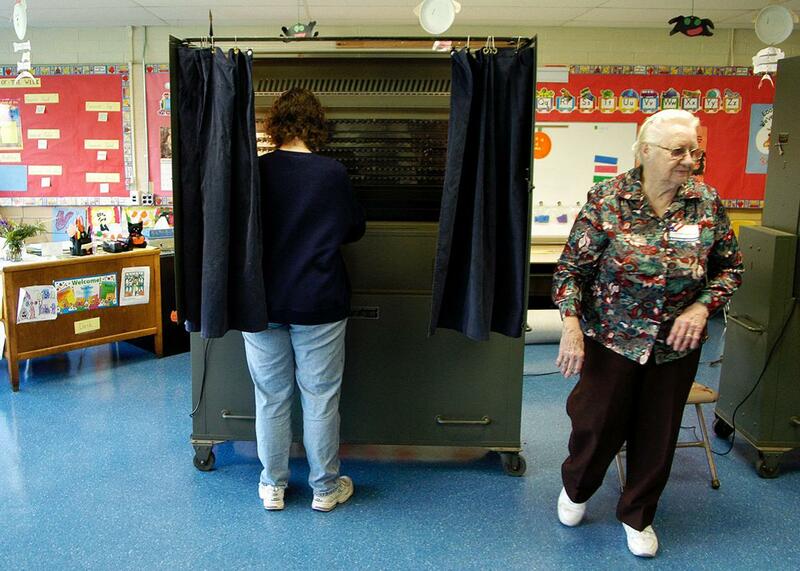 A woman prepares to cast her ballot in a voting booth in Southampton, Pennsylvania in 2004. Although more than half the country may be unhappy with the results, America dodged a bullet on Election Day. That is, our voting machines generally held up. The tabulations they produced were not so close as to throw the election results in doubt, and there’s no legitimate indication that any were hacked. In the next presidential election, we may not be so lucky. With antiquated voting devices at the end of their projected lifespans still in widespread use across the country, the U.S. is facing an impending crisis in which our most basic election infrastructure is unacceptably vulnerable to breakdown, malfunction, and hacking. It’s not just an inconvenience. If the machinery of democracy is called into question, so are its foundations. Those of us who can recall the presidential election of 2000 know exactly what can happen when faulty technology meets a razor-close election. The Bush-Gore contest came down to just a few hundred votes in Florida, and butterfly ballots and faulty punch card machines left us arguing about hanging, dimpled, and pregnant chads. It left wounds that still afflict the country. In today’s hyperpartisan environment, such a scenario—or even unfounded accusations of a “rigged” election that gained postelection traction—would be far more contentious. Just imagine what it might be like in 2020. Absent a wholesale replacement of our outdated electoral equipment, this scenario is becoming increasingly likely for our future elections. The problem of aging voting technology reaches nearly every corner of the United States, as we documented in a report released by the Brennan Center for Justice in 2015. Unlike voting machines used in past eras, today’s systems were not designed to last for decades. Although it is difficult to predict how long an individual machine will reliably function, the experts we spoke with generally agree that machines purchased since 2000 have expected lifespans of only 10 to 20 years. (And for most systems, it’s probably closer to 10.) This makes sense: No one expects a laptop to run reliably for more than a decade. Yet on Election Day 2016, 42 states used voting machines that were at least 10 years old, and 13 of those states used ones more than 15 years old. If replacements continue to stall before the next presidential election, many more will surpass their recommended retirement age. Perhaps even more troubling, these aging machines are particularly vulnerable to hacking. Although the country has made important advances in securing our voting technology in recent years, these older devices often rely on unsupported software (we found machines still operating on Windows 2000) that doesn’t receive the regular security patches that help protect against modern methods of cyberattacks and hasn’t been through the relatively rigorous federal certification program that exists today. What’s more, many of these systems don’t have a physical paper trails or ballots to back up the results, meaning there’s no way to independently verify how voters intended to cast their ballots in the case of a suspected hack. Our country’s patchwork of jurisdiction-by-jurisdiction voting systems would make it difficult to manipulate results on a national scale, but hackers could still do considerable damage by tampering with votes in a swing district, stealing records to undermine voter privacy, or just sowing suspicion of a larger conspiracy. Though voting went relatively smoothly this year, a scattering of issues that popped up during the election hinted at what problems may await if we fail to replace aging equipment. Voters complained of touchscreen calibration errors that “flipped” votes in North Carolina, Texas, Nevada, and Georgia and interfered with selecting straight party tickets in Pennsylvania. Optical scan machines malfunctioned in parts of Michigan and Massachusetts, and a few in Illinois had to be replaced because a “memory card blew.” Although all of these issues appear to have been resolved by delayed or alternate voting methods, that doesn’t mean that glitches like these are unproblematic. It may never be clear how many people didn’t vote in this election because of the wait times. In the 2012 election, between 500,000 and 700,000 failed to vote because of long lines. These voting machine issues aren’t a surprise. We have heard from dozens of election officials who say they struggle to keep their aging machines running and that replacement parts are increasingly difficult, if not impossible, to find. Some even said they have resorted to eBay to find antiquated parts—from analog modems to dot matrix printer ribbons—to keep their voting systems running. Prior to the election, we surveyed 274 county election officials in 28 states. More than half of the officials said that they would need new machines by the 2020 presidential election, and 80 percent of those said they did not know if or how they would be able to pay for the replacements. At least according to data we collected from four states—Virginia, Ohio, Minnesota, and Colorado—Cortés’ suggestion proved troublingly true. In these states, counties whose election officials purchased or had near-term plans to purchase new machines had an average median household income of $10,000 or more than those that did not. In Colorado, we also found an urban and suburban versus rural divide—counties that replaced machines generally had a higher population density. If only some counties can replace aging voting equipment, it is possible that machine breakdowns could disproportionately affect certain voters—namely, rural or working class and poor voters. Our political discourse is full of talk of the need for investment in infrastructure such as roads and bridges but almost never includes mention of that infrastructure most critical to a functioning democracy: our voting system. We estimate that the nationwide cost to update voting machines could easily cost $1 billion—in fact this might be a low estimate since replacing machines will likely require the replacement of other incompatible systems. Considering the size and scope of the federal budget, this is a paltry sum. If the expense is shared with the states, it should be a small lift. Lawmakers can start with a smaller, immediate investment prioritizing the aging electronic devices that are, by far, the most insecure. Unfortunately, to date, there has been a lot of buck-passing, with federal officials arguing this is a responsibility of the states, and with state officials arguing that the burden should fall on counties. But counties and towns have other pressing budgetary needs. The truth is that until there are problems, most citizens don’t think about voting machines. They are far more likely to be concerned about whether their roads are paved, the snow is cleared, and their teachers are paid. The good news is that at least a few federal officials and experts are paying attention. Last year, Rep. Hank Johnson, D-Ga., introduced a bill that would allocate $125 million in matching grants for states to replace outdated voting equipment. Some—including Secretary of Homeland Security Jeh Johnson and a bipartisan group of security experts that included former National Security Agency director Michael Hayden—have stressed the necessity of securing and investing in our voting systems, as we do critical infrastructure like the electric power grid and nuclear sites. Others, such as computer security expert Bruce Schneier, recommend that the government develop processes for detecting and responding to malfeasance, including standards for fair resolution of an election should tampering be discovered. Considering all that could have gone wrong, Americans were lucky not to have a major contestation of the results on Nov. 8. We can’t rely on such luck next time. There’s four more years until the next presidential election—and we need to start thinking about this problem now, not just a few days before we cast our 2020 ballots.